Toss cooked pasta in 1 tbsp oil and salt/pepper to taste. 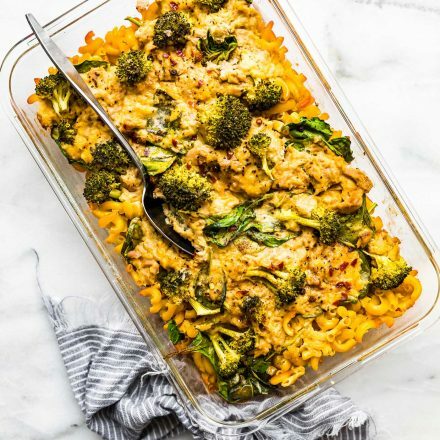 Layer pasta on bottom of 12×8 glass meal prep casserole dish. Layer on top of pasta. In a small bowl, mix 1/4 cup hummus with 2 tbsp olive oil. Whisk in a bowl until creamy. Layer the spinach and broccoli on top of tuna in the casserole dish. Add your creamy hummus/oil mix on top. Add any extra seasoning you’d like. Taste/adjust. Set aside. Alternatively, you can also SKIP BAKING and just store prepped casserole in fridge, covered, until until ready to bake. Store in fridge for up to 5 days.